Browsing 2 posts in sinusitis. I hear this from patients a lot. Actually, I hear it all year round! I’m not exactly sure what time of year is prime time for sinusitis, but since our seasons are constantly changing here in Michigan, this Saginaw dentist thinks that it’s typical 365 days a year. The sinuses are multiple air filled cavities that are connected to the inside of your nose. They are lined with mucous membranes. Sinusitis is inflammation of the sinuses due to infection, allergies or some autoimmune problems. The most typical symptoms of sinusitis are headache, drainage and occasionally toothaches. 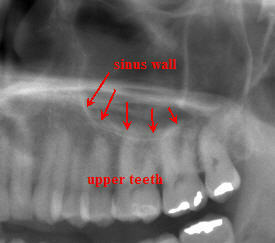 Since these sinuses are “dead end” air spaces the inflammatory process allows pressure to build up. If the sinuses aren’t able to drain this can cause serious pain. Why do my teeth hurt when I have sinusitis or a sinus infection? 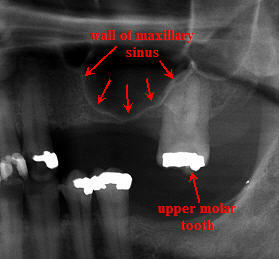 Your upper teeth, particularly the upper molars, are sitting right next to your sinuses. It’s quite common for someone to present with a toothache when they’re having sinus troubles, even when it isn’t a tooth problem. Often the toothache will be difficult to localize to one tooth. The dentist needs to perform tests to determine the cause of the toothache. When in doubt, I often treat the patient for an acute sinusitis and check back with them in a couple of days. If it’s really a tooth problem, the sinusitis remedy won’t have helped very much. It’s interesting to note that if you lose an upper tooth the sinuses can actually “grow into” the spot where your tooth used to be. This process is called “pneumatization.” In cases where we want to try to place an implant to replace an upper tooth the surgeon has to push the membrane of the sinus up and replace it with bone. This is called a sinus lift. How do you treat sinusitis? Root canals. Treating a tooth that’s actually referred pain from sinusitis with a root canal won’t help. And worse, you get a root canal that you don’t need. Get the right diagnosis! Sinusitis has never been helped by a dental drill! Sinusitis is common. It is also miserable. It’s important to get the right diagnosis, so ask your dentist or doctor good questions. Better safe than sorry! Do you have any good sinus stories? Leave them in the comments section below. I’d love to hear them. Do you have questions or comments about this website? Feel free to email me at alan@meadfamilydental.com. I answer my own email!